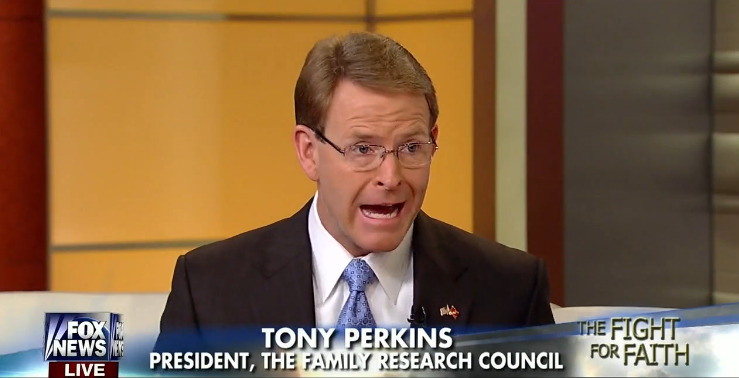 Is Tony Perkins the Most Disingenuous Person on the Planet? 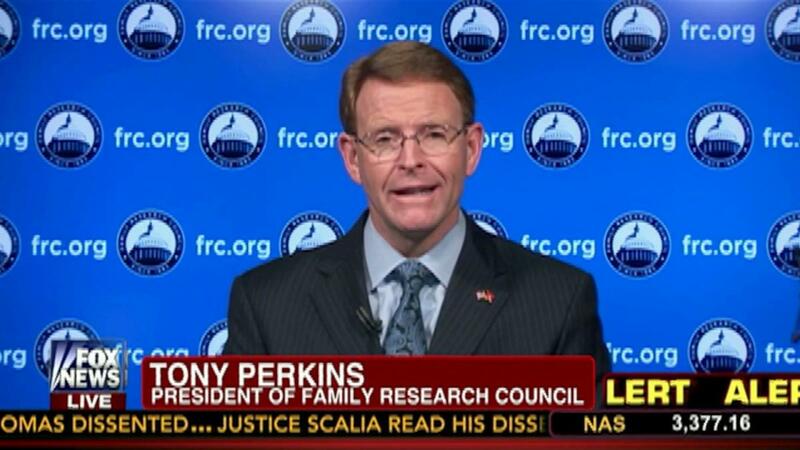 Perkins heads the Family Research Council, one of the Religious Right organizations that has been designated a hate group by the Southern Poverty Law Center for a long record of smearing LGBT people with false and denigrating rhetoric. Perkins used his press club appearance to repeat his charge that it was irresponsible for SPLC and other groups to describe his organization that way. He suggested that FRC’s critics had created a climate that contributed to the recent violence at FRC headquarters in downtown D.C.
Let me say that it was genuinely sobering and moving to hear Perkins describe the incident, in which a security guard who may have saved the lives of many FRC employees was shot while disarming a gunman. No one should be put in the position of being hunkered down in their office in fear for their life. No one should be subjected to violence for participating in the public arena. At the time of the shooting, progressive and gay rights leaders immediately and unequivocally denounced the attack on FRC. It is true that irresponsible and hateful speech can poison our public discourse. But in today’s political climate, that speech is most likely to come from right-wing groups and their allies. I remember feeling nervous as well as outraged when Jerry Falwell and Pat Robertson, two days after the 9-11 attacks, blamed People For the American Way by name, as well as feminists, liberals, and others. And the right’s rhetorical extremism has become supercharged since the election of President Obama. What does it even mean for Perkins to make a public commitment to advocate with civility and compassion when his guests at the head table include rhetorical bomb-throwers like Bishop Harry Jackson, who has said that gay rights advocates are trying to recruit young people “just like during the times of Hitler” and that gay marriage is part of a “satanic plot” to destroy the family, and Rep. Louie Gohmert, who participated in the McCarthyite smear of Hillary Clinton aide Huma Abedin and who says that President Obama “wants a dictatorship?” Or when he recently hired as his executive vice president retired Gen. Jerry Boykin, who has called for limits on American Muslims’ religious liberty and accuses Obama of using the health care reform law as cover to create a private army of Brownshirts? Perkins also used his speech to promote this weekend’s Values Voter Summit, which is co-sponsored by organizations whose leaders regularly spout rhetoric that is often even more extreme than FRC’s — about LGBT Americans, Muslims and other non-Christians, supporters of church-state separation and more. Among the worst are the American Family Association, whose spokesman Bryan Fischer is such a torrent of bigotry that it cannot be easily condensed, and Liberty Counsel, whose Matt Barber purveys loathsome attacks on his political opponents, charging that satanic gay rights activists are “running interference for pedophiles” and charging that groups supporting church-state separation, like People For the American Way, are enemies of religious freedom. Calling for civil discourse on the eve of the Values Voter Summit sounds like nothing more than a bad joke. 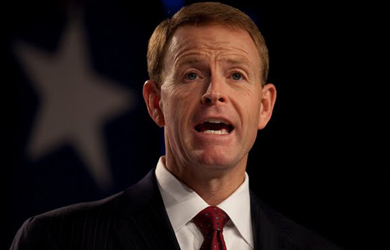 If Tony Perkins is at all sincere about his call for civility, this weekend would be a good time to start.